A Met Éireann weather forecaster has urged the public to stay in touch with the weather forecast this week as there is a 'ferocious looking beast' heading for Ireland. The warning was issued by Joanna Donnelly who was the weather forecaster who announced the Status Red warning for Storm Ophelia last year. 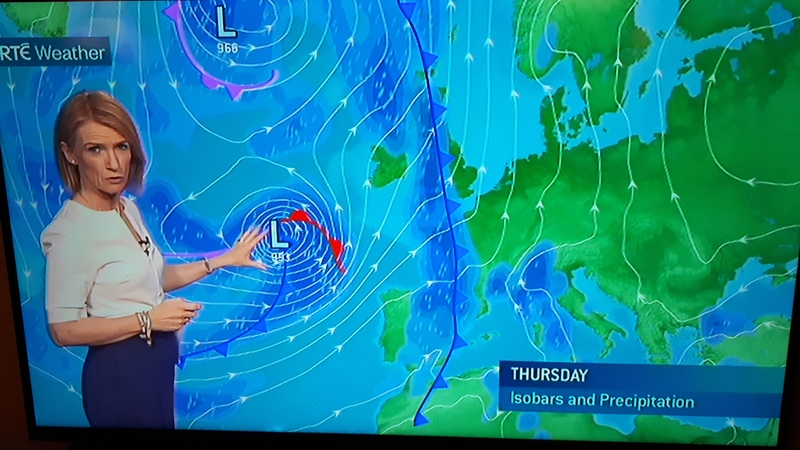 In her nightly bulletin after the 9pm RTÉ News, she said Wednesday would be a mild day with temperatures hitting 20 degrees thanks to African originated weather but this will be followed by a very wet day on Thursday. The potentially dangerous weather is due to sweep in on Friday. "The next system in out in the Atlantic. As you can see from the chart (it's) quite a ferocious looking beast coming our way in low pressure with associated strong winds and heavy rain," she said. She cautioned that the weather could move to the left or right has it moves towards Ireland. She urged people to keep in touch with Met Éireann's website www.met.ie or stay tuned to the forecaster's weather bulletins on RTÉ. The front has yet to be given storm status but if is upgraded it will be called Callum. Tomorrow, Tuesday will be another blustery day. Dry in many places with the clouds breaking locally to allow some sunny spells to develop. But further heavy rain for a time in the northwest, but drying out later in the afternoon. Top temperatures of 15 to 18 C., in strong and gusty southerly winds. Tuesday night will be mild and mainly dry with moderate South to Southeast winds, stronger around coasts. Lowest temperatures around 10 to 12 degrees. Wednesday will be mostly dry and pretty blustery with sunny spells. Perhaps a little drizzle in Southern coastal areas. Southeasterly winds will be strong and gusty during the day but it will be very mild for October with highs of 17 to 20 degrees. Wednesday night will continue windy with rain likely to develop in the West and Southwest overnight. This band of rain is expected to move across the rest of the country on Thursday morning and in the early afternoon turning heavy in parts. Drier weather with brighter conditions will follow from the Southwest during the day and the winds will ease. Highest temps of 14 to 16 degrees. During Thursday night/Friday morning there is the risk of stormy conditions developing as a deep area of low-pressure tracks to the West of Ireland in a strong South to Southwesterly jet stream. Strong to gale force Southerly winds could potentially give some damaging gusts especially in the West. Heavy rain will clear to showers, with the risk of further rain returning from the South later. There is also the risk of coastal flooding due to high tides and surge.